I picked it up last Thursday from the quilter and couldn’t wait to get the binding sewn on over the weekend. 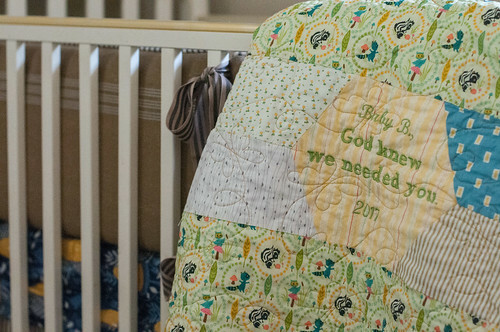 For some reason I never feel ready for a baby until I have its quilt completed. Yes, I know how strange that is (especially considering I have not packed a single hospital bag or finished the nursery), but it’s how I nest (I’m also working on a little cross stitch project for the nursery wall and I’m feeling antsy that it’s not finished yet either!). 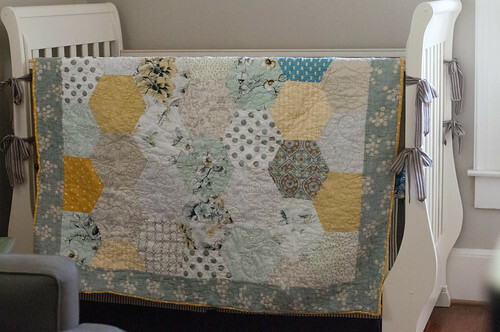 With this baby (that we call “Baby Bee” since it’s either going to be Baby Bonnie or Baby Benji and we have a bee-themed nursery) it made complete sense to do a honeycomb quilt (also known as a hexagon quilt). This quilt was made using “half hexies” (using this Hex ‘n More ruler) that I sewed together. 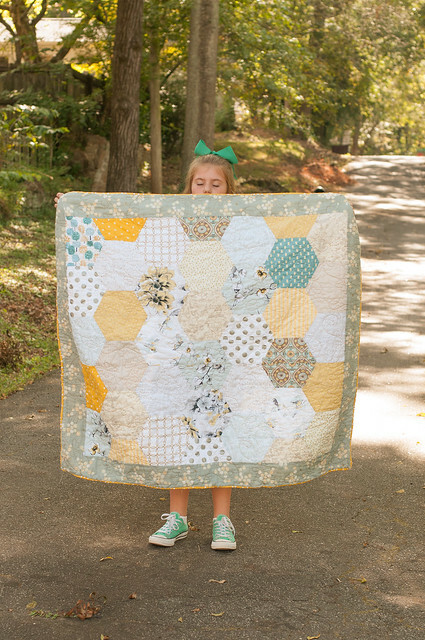 This blog post was my inspiration and I used this blog post for the hexagon quilt tutorial. The most time consuming part was cutting the hexagons (or should I say, the half hexagons) out because I used a lot of different fabrics. 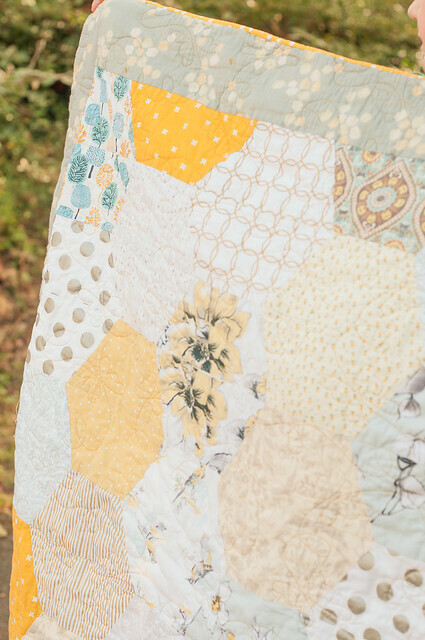 After I pieced it together and made a back I took it to my local quilter who quilted it with butterflies (the closest they had to bumble bees) in a variegated gold thread. 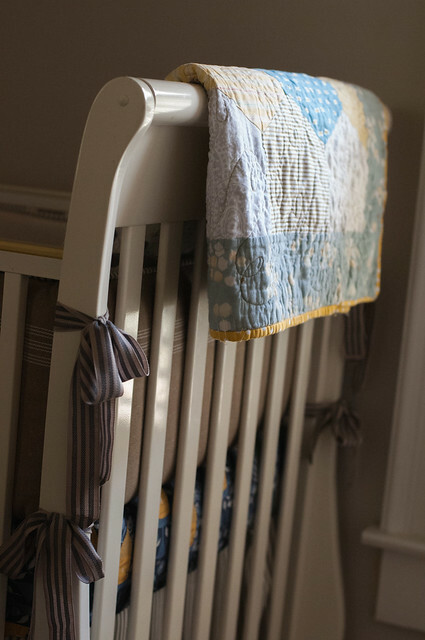 I love the way it came together, but I hope it’s gender neutral enough (C. likes to joke that I make everything girly–the entire time I did Moseby’s nursery (we didn’t know if we would be adopting a boy or girl at the time) he would have to reign in my feminine touches, haha). And like always, I had to add a note to the baby on the back of the quilt and while it’s always very short I think about it for months before I embroider it. And as much as a shock that this pregnancy was I am now beginning to clearly see that this statement is so true…even though I was 100% finished with having babies (especially from my body!) our family needed this baby. I can’t wait to see its face for the first time–to make eye contact and catch a little glimpse of its soul like I have with my other three–to see just who this amazing person is that God knew we needed to have even though we didn’t realize it. It’s pretty incredible when you think about it like that. That is gorgeous! What a sweet tradition.